ESPN.com | Profile | Member Services | Not null? 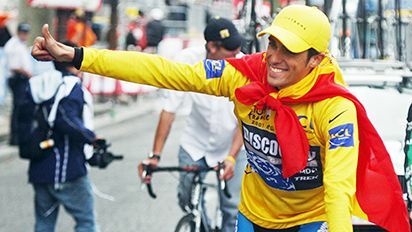 Contador is the first Spaniard to win since Miguel Indurain in 1995. Alexandre Vinokourov has been fired by the Astana team following his positive test for blood doping during the Tour de France, the team announced Monday. Michael Rasmussen denied using performance-enhancing drugs and did not rule out competing in next year's Tour de France. Cyclists are rolling into Paris on Sunday, and perhaps symbolic of their doping-tainted Tour, they ride by the Chatenay-Malabry lab where tests are conducted. While most days at the Tour didn't turn out the way we expected, we're still going to have the time-trial showdown we wanted. The owner of the Tour de France called for cycling chief Pat McQuaid to step down Saturday after a long-running feud that escalated at this race and threatens to divide cycling. Professional cycling is in public spaces. It's chaotic and edgy, thrilling and petty, full of arcane etiquette, rife with ego and political infighting, and often dysfunctional -- never more so than in the past 48 hours.